The "San Francisco Treat" has been made by Chicago-based Quaker Oats for years. It was really good stuff!! Forget my previous comment about Rice-a-Roni! 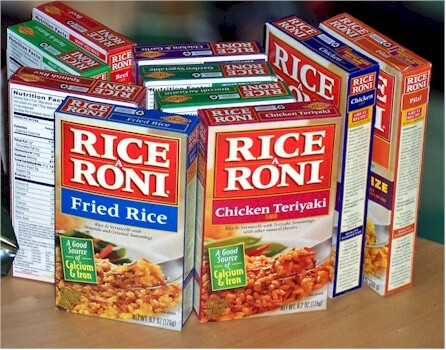 Used to wonder why the commercial called it Rice-A-Roni when the box clearly said "Rice Roni." Until someone pointed out the tiny "A" on the box. Hmmm, do I detect a conspiracy theory developing here? Were these products shot down by the (meat / fast food / ???) industry?? Back in 1976, I remember Lipton's "Make a Better Burger" meat extender. It wasn't around very long,was it? Lipton also had a beef stroganoff mix that was good, but it disappeared from the grocery shelves around 1975. There used to be a Rice-a-Roni Strogonoff that was fantastic when mixed witha pound of ground beef. I haven't seen it in 30 years. Salt Lick in a box! One of my favorite foods as a kid. Well, the factory may have been in San Francisco, but the commercial jingle made it sound like a traditional regional delicacy or something.